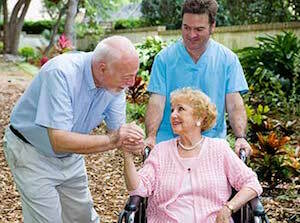 Visits to a loved one in a nursing home can— and should be fun and enjoyable for both the patient at the visitors. The social interaction and stimulation provided by nursing home visitors is crucial for patients’ emotional well-being and can be a welcome diversion to mundane living situations. However, don’t forget to take a few moments during your visit to do your own mini-assessment of your loved ones physical condition and the condition of the overall facility as well. Take a step back and use your common sense and reasoning and really look at how your loved one looks. Take a look at their skin—is it pale and ashen? Are they having difficulty opening their eyes? Have they lost a significant amount of weight? While some observations may not be cause for immediate alarm, others should be brought to the attention of the staff. If you observe any indication of injury or abuse, these should be immediately brought to the attention of the staff. In patients who are bed-bound, pull back the sheets peek under the robe. Is everything clean? Are their any dry or cracked areas of skin? Is there any unpleasant smell? Does everything look ok? As we age, our sensory perception begins to decline and as a result many elderly simply lack the ability to perceive potential problems with their body—particularly in areas that may not be visible. If you suspect something does not look right with your loved one — it probably isn’t. In many situations an early diagnosis of medical conditions, such as pressure sores (also referred to as pressure ulcers, pressure sores or decubitus ulcers) can drastically help improve the chances for a complete recovery– and may actually be a life saving intervention down the road. Similarly, with respect the facility itself, take a careful look at the patient’s room itself, but also the common areas such as the recreation room and cafeteria. Is this a place that you would be comfortable living in? If not, why? If there are problems, specifically identify each problem and bring it to the attention of a supervisor. Giving constructive criticisms to the staff alerts them to conditions, which may not be readily apparent to those at the facility on a daily basis and will help improve the living arrangements for all patients at the facility. Remember, you’re not being a pest when bringing your observations to the attention of nursing home staff! In caring for a friend or family member you, can and should be an advocate. If you don’t look out for your loved one’s best interest, who will?